Dvořák & America | Kevin Deas | Dispeker Artists, Inc. 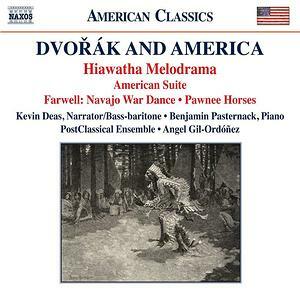 The centrepiece of this programme is the first ever recording of the Hiawatha Melodrama, a concert work for narrator and orchestra designed to show the kinship between Dvořák’s New World Symphony and Longfellow’s poem The Song of Hiawatha, which Dvořák said had inspired him in the symphony. It takes music from the symphony, as well as passages from the American Suite and Violin Sonatina, and fuses them with the poem, which is recited by a bass-baritone. Also included is music by Arthur Farwell, who was influenced by Dvořák, and was a proponent of Native American music. This recording thus celebrates the crosscurrent of influences between the Czech composer and American music and culture.